You don't need to colour her hair, what an amazing card. I love the colours and the softness of this. Just amazing. Oooh, la, la, she's gorgeous! LOVE your colouring! I think her hair looks fabulous just like that! 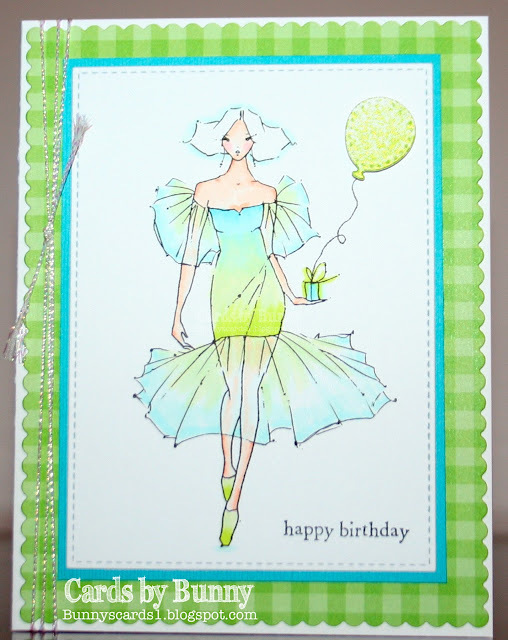 Beautiful coloring and card! Thank you for joining our Double D challenge! I think she looks very stylish with white hair and your coloring is FABULOUS! So glad you found our blog. Thanks so much for joining in the fun at our Double D ‘Simply Gingham’ challenge! We hope you’ll come back often. Gorgeous colouring, Bunny! Thanks for trying two colour ombre and entering our challenge over at A Day for Daisies. Good luck! Hi Bunny Congrats on your win with this card - its super! Great card, love the colours you have used & her hair looks fab!